It’s an exciting time around the world for flood insurance, with new mass markets opening up through the introduction of the necessary analytics and (in some cases) reinsurance capacity. In Canada, for example, it was nearly impossible to get flood coverage on residential property — until last year. After the floods of 2013 in Calgary and Toronto, it was inevitable that flood insurance would become available, but it was uncertain how it would be implemented. The Insurance Bureau of Canada (IBC), the federal and provincial governments, and the insurance industry have explored the possibilities together, and now flood insurance is about to really happen. Unlike the United States, where flood insurance is evolving from a centralized and subsidized program to the private market, Canada has no legacy that needs to accommodate new flood products. Historically, water damage was only covered for “sewage backup”, which proved to be inadequate for everyone in 2013. When entire streets of urban homes are submerged, it’s highly likely that dirty water will enter houses through the sewage lines. But most of the water damage in such circumstances is definitely not caused by the sewer back-up. The resulting claims were mutually unsatisfactory: homeowners were technically not covered for most (if not all) the damage they sustained but they nonetheless claimed the damages with nowhere else to turn; insurers paid the claims for which they had not collected premium to avoid public relation disasters. 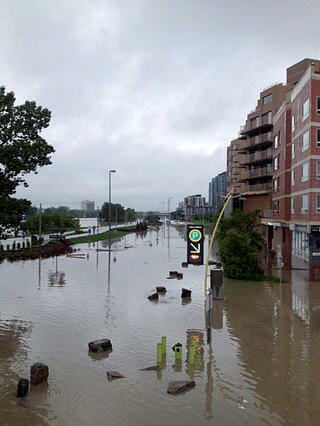 By 2014, it was clear that Canada needed generally available flood insurance. Now, Canada has a nascent flood insurance market. A handful of carriers are offering flood coverage, and there are also some brokers who hold cover from London to underwrite flood. But the flood products are poised to really mature and go mass-market in 2016. The analytics available for underwriting flood are based on the latest technology, data, and concepts from around the world (including Canada). The expertise is in place, the will is established, and residential flood insurance will be widely available in Canada for the first time in its history. It is an opportunity for insurance, as an industry, to demonstrate, again, how solid risk management can genuinely improve the lives of its customers.